Belt's are all the rage this year! This season women’s belts are being worn loose about the hips or cinched around the waist to accent feminine lines with fluid fabrics, your favorite jeans or fitted sweater dresses. And with retro and vintage elegance back in style in a big way, the buckles are the focal point, some with crystal accents, vintage elements or hammered metal. Women’s leather belt designs never go out of style, especially to accent jeans, but the new looks allow you to wear one over tunics, slip dresses, maxi dresses, you name it. It’s all up to you, women’s fashion belts are there to give a final touch of individuality to your look no matter your style. A great looking belt can turn an ordinary outfit into an extraordinary one. 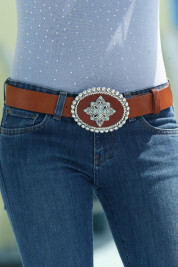 Interchangeable buckles and belt straps can create many different looks for less money, and besides, who doesn’t love to stretch their fashionista dollars! As always, no matter what you choose to wear, remember to always be Uniquely You.